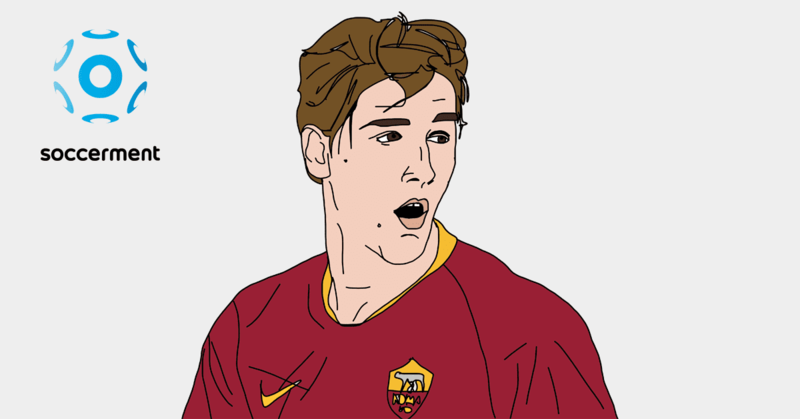 Recently, we have tried to assess the Italian Serie A player who could lead the topscorer table at the end of the 2017/18 season. We apply the same methodology to the English Premier League (EPL) and look for the player who will be awarded the golden boot this year. As it often happens, the final award will likely be contented by the forwards belonging to the top teams. It is therefore not hard to imagine that Harry Kane and Sergio Aguero will battle again to be the EPL topscorer. They won the award in the last three seasons (Aguero in 2014/15 and Kane in 2015/16 and 2016/17), netting more than 20 goals each. Apart from being two of the most gifted players in Europe, it is important to remember that both Kane and Aguero are playing in two of the best teams in the EPL. Having behind them the likes of David Silva and Christian Eriksen can make a big difference in the final output. Before going straight into the goal analysis, it is crucial to understand why Aguero and Kane are continuously outperforming their peers. The best way, is to look at what leads to a goal: a shot. And their shot output is great. Aguero was among the kings of shots last year, with 4.5 every 90 minutes, while Harry Kane displayed 4.0 shots P90. However, a generic shot-output is not enough to fully assess how good the two were. The most important thing of a shot it is to be directed into the goalpost. 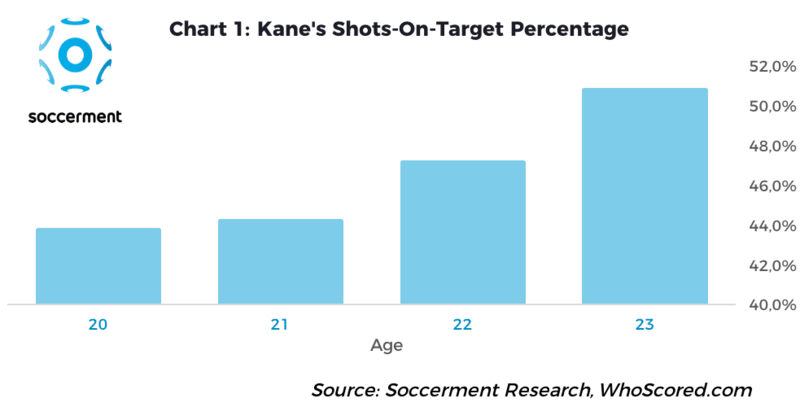 Last year Kane collected a 50.8% shots-on-target conversion, meaning that more than half of his shots went into the target. That well explains how he could have achieved 29 goals in one season. As Chart 1 shows, Kane has been able to constantly increase this percentage over the past four years. Instead, last season Aguero seemed a little bit less accurate than usual. He barely achieved a 40.0% shots-on-target percentage versus a 43.1% weighted average for the past 8 years (we give a higher weight to the most recent seasons). 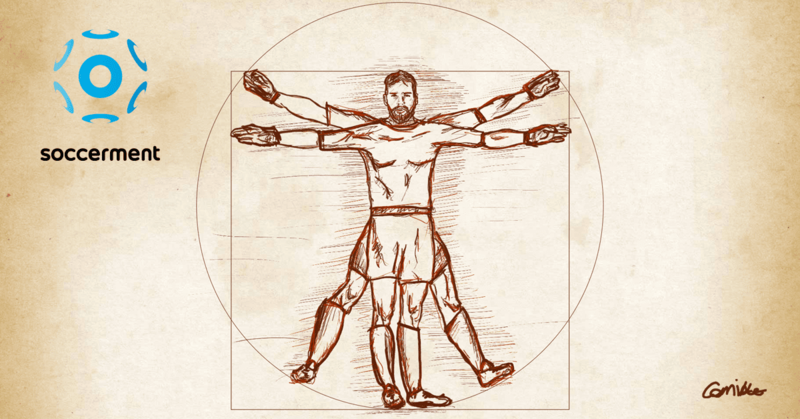 Furthermore, his goal conversion in open play dropped to 11.9% vs. 14.3% weighted average. 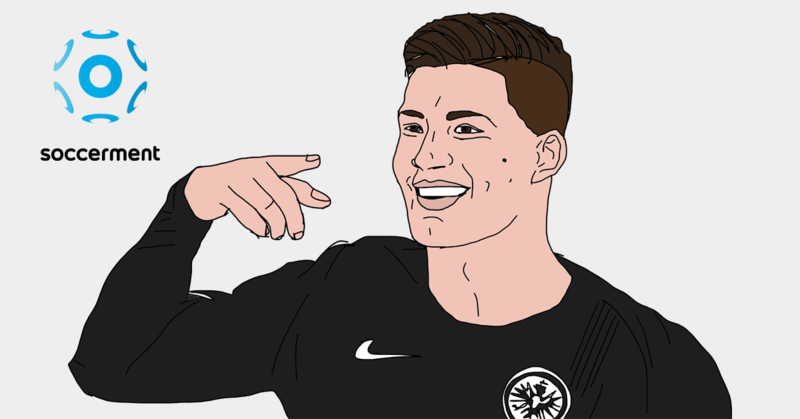 As a result – he netted “only” 20 goals. 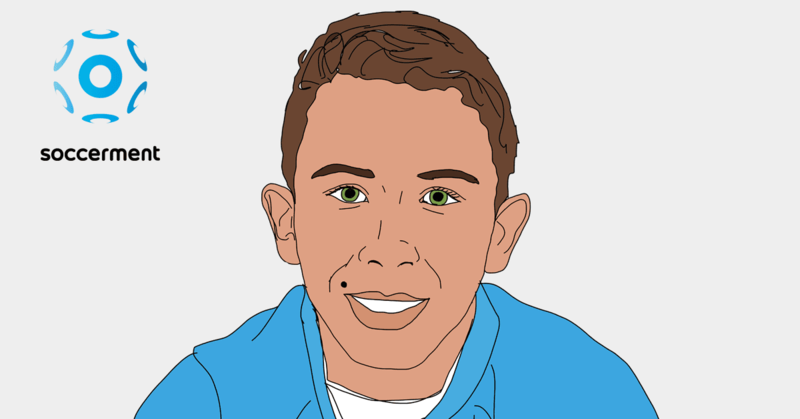 We believe Aguero’s performance could be supported by some mean reversion this year. 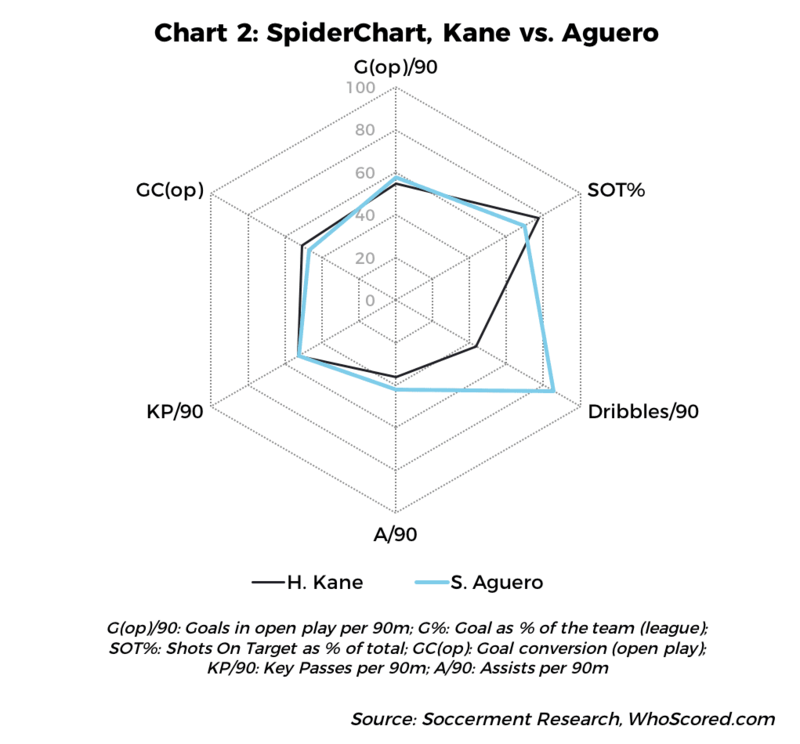 In Chart 2, we give evidence to the two players’ main KPIs, with the only real difference being the ability to dribble, where Aguero tops the charts (2.6 successful dribbles P90 on average vs. Kane’s 1.3 P90). In the last five seasons (except in 2014/15) Romelu Lukaku has always been present in the top 10 table of EPL topscorers and his recent transfer to Manchester United will definitely increase his chance to battle the leadership of the duo Aguero – Kane. Looking at his last season’s KPIs, the idea of Lukaku being one step behind both Aguero and Kane seems to be well founded. He accumulated 3.0 shots P90, hitting the target 1.5 P90. Here, the general rule works again. Fewer shots, fewer goals; or even better: fewer shots-on target, fewer goals. However, as previously stated, playing for ManUtd should increase his number of chances. Another way for Lukaku to disprove us, would be to continue generating his best chances inside the box as he did in the first two matches (seven out of eight shots). This will certainly help him out to maximise his final output. Moreover, his skills to win areal duels are well beyond the average EPL striker (3.0 p90) and could be a powerful weapon at his disposal. At the end of the day, Lukaku is 190cm tall and weighs 94kg: simply put, it is not easy to stop him! Both Lacazette and Morata are the new number 9 of their clubs (Arsenal and Chelsea, respectively). Alexandre Lacazette, after seven seasons wearing the Olympique Lion jersey and scoring 100 goals decided to join Arsène Wenger’s project. After five seasons between Italy and Spain, Alvaro Morata decided to move to England, to substitute the departure (not yet defined) of Diego Costa from Chelsea. Both players come from a wonderful season in which they aggregated superlative stats. 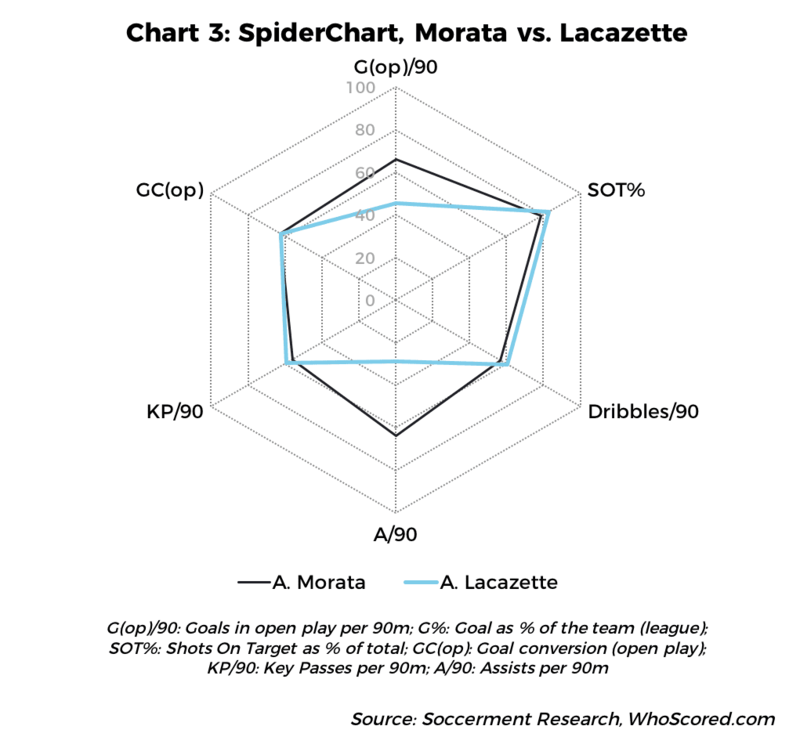 Despite a normal amount of shots p90, their scoring stats were great, as they both managed to hit the target at about 50% rate (Morata 48.6% and Lacazette 51.1%). The Spaniard’s stats could be inflated by the fact that in Real Madrid he mainly played as a substitute. 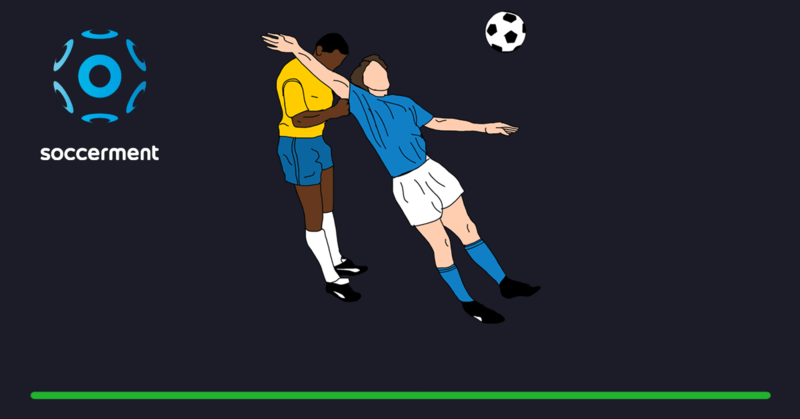 Therefore, most of his shots materialized at the end of the matches, when the opponents where trying to recover results (as Real Madrid was usually leading the match). The shots in these situations (counterattack) are statistically more likely to hit the target. Instead, Lacazette’s remarkable numbers must be weighed up according to the strength of Ligue 1. For comparison purposes, in Chart 4 we display how the goals-per-90mins stats of Zlatan Ibrahimovic declined from the French Ligue 1 (‘FL1’) to EPL. We obviously need to point out that Lacazette is much younger than Ibrahimovic, who might have had an age-effect. 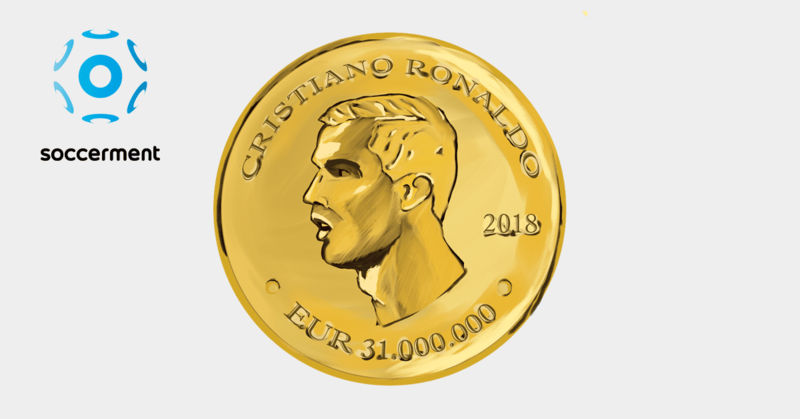 In any case, it seems to us that it will be really hard to replicate such numbers in the coming season, especially when it comes to the very high conversion rate (both at 19.1%). Last season Alvaro Morata appeared as one of the greatest talents in Europe. This year, accumulating a higher numbers of appearances, he could prove that the £54 million transfer-fee that Chelsea paid was worth it. It is a different situation for Lacazette, that will need to prove his skills in a much more difficult league than FL1. 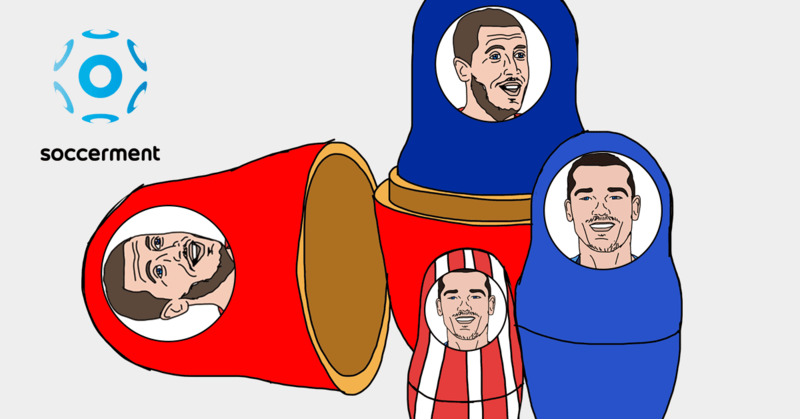 As fans, other than analysts, we love to see stories like the one of Vardy, who scored 24 goals in the 2015/16 season and almost won the topscorer table, despite the odds being very much against him (and Leicester) at the beginning of the year. Last year there were no major surprises in the first positions of the table, with the only outsider being Joshua King of Bournemouth, with 16 goals. 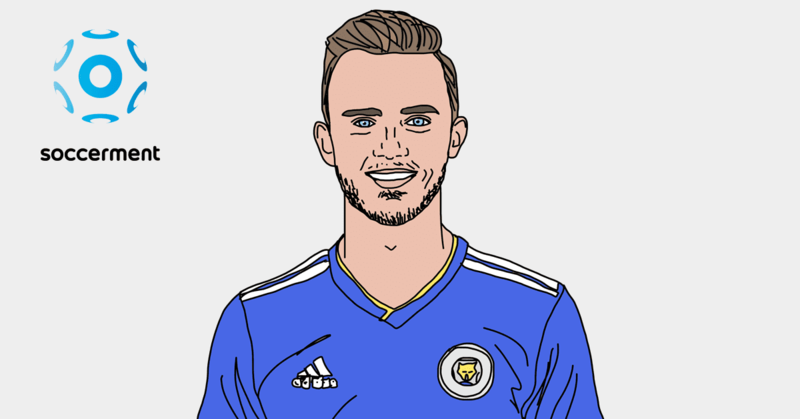 For this season, we highlight Huddersfield’s Steve Mounié as the potential surprise. He’s only 23 years old and last year with Montpellier he managed to score 14 goals without penalties. 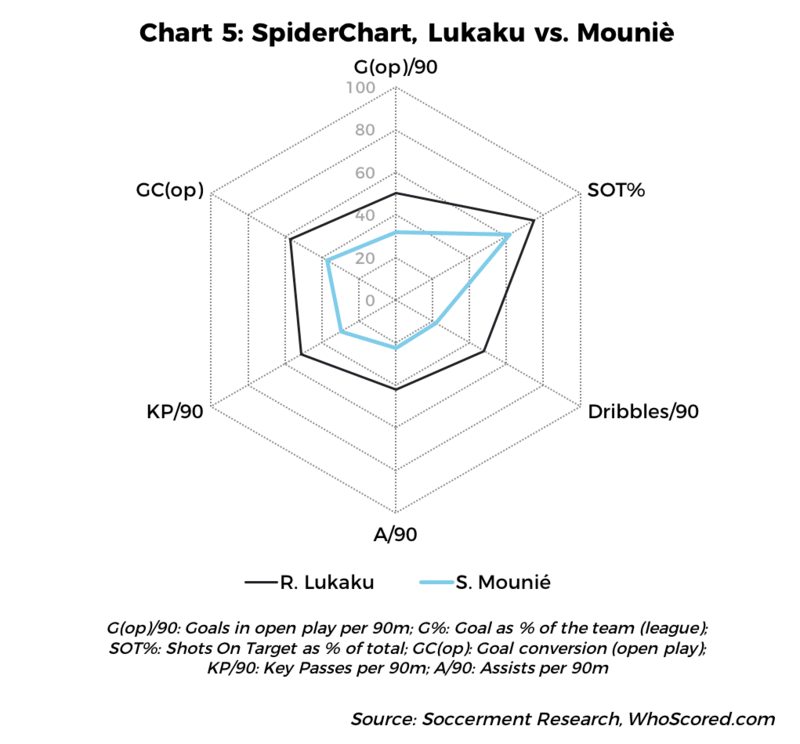 Physically, he somewhat reminds us of Lukaku and their spider charts (Chart 5) are similarly shaped, although his attacking output seems far behind Lukaku’s, as well as the one of the other aforementioned players. However, Huddersfield’s first two wins have impressed everybody: maybe something special is cooking up again? 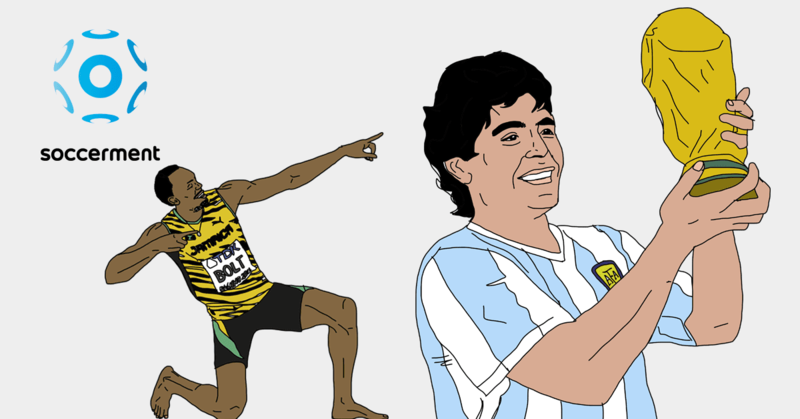 For requests or comments you could send us an email at: research@soccerment.com.